Robotiq was founded when lab-mates Samuel Bouchard, Vincent Duchaîne, and Jean-Philippe Jobin decided to commercialize some of the mechatronic work they and their professor Clément Gosselin had created at Laval University in Quebec City. That was in 2008. Today, Robotiq employs 90 full-time staff, and its grippers, sensors, and cameras operate in 52 different countries. For nearly two years now, we’ve been telling the stories of our team members. A small Latin quarter has popped up in a corner of Robotiq’s head office. If you happen to hear Laurence Belhumeur Roberge on the phone or read her WhatsApp messages, you'll soon discover some of the links that now exist between Robotiq and Latin America. Laurence speaks Spanish throughout most of her working day, as she helps clients in Mexico and other Latin countries automate their operations. Laurence hiking the Santa Cruz Trek in Cordillera Blanca, Peru. As Channel Sales Manager for Latin America, Laurence’s combination of charm and know-how has helped her build relationships with numerous Spanish-speaking clients. Laurence is especially fond of how people from this part of the world conduct business by making sure to first connect on a social level. "They want to know how you're doing, how your family's doing, how your brother’s doing," she says of the approach her many partners take to connecting with her. "We always start with our news. Then we start discussing how we can grow the business together." She also meets her clients in person in their countries, and occasionally in Canada. Laurence works with application engineers and integration coaches – who might be called on to figure out how a robot can, say, connect an axel to a wheel – while they help clients sort out a myriad of automation conundrums. On a macro level, she's also figuring out what it takes to open up more markets in Latin America, as she wades through tariffs and trade agreements and speaks with federal and provincial civil servants. And to think that less than a decade ago, this 27-year-old was looking at how she could forge a career out of her love of languages, growing interest in business development, travel bug, and curiosity about different cultures. They seem to all be playing a role in this corporate telanovela. Laurence grew up in Victoriaville, an hour and a half outside Quebec City. Her parents, both educators, wanted her and her younger brother to learn English and tried to find opportunities for them to learn the language. The family would often go camping and, if there were English-speaking families, her parents would insist the two siblings introduce themselves to the other children. For Laurence, languages would eventually become a favourite subject in school. She spent much of her childhood playing in the woods behind her home. She and a group of friends would run to their favourite giant tree, hang out, and build things. Victoriaville has remained an important touchstone for her; it's a place she and her brother, who now lives in Montreal, visit regularly to see family and be in nature. Her accomplishments seem to be born from a place outside of competition. Take swimming, for example. As a teenager, she swam at a competitive level, but it wasn't all about the medals: "I really liked the adrenaline rush of competing, but it wasn't a priority for me to win this or that specific race. I was doing it because I wanted to be in shape and I liked to swim." 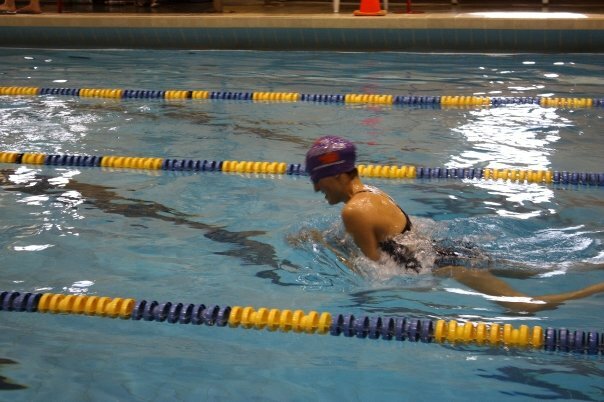 When Laurence was a teen, she took a pretty non-competitive approach to competitive swimming. That love for the water and her skill as a swimmer led her to become a lifeguard at a city pool, where she worked for seven summers. "These summers were unforgettable. They were the best time of the year," she says. 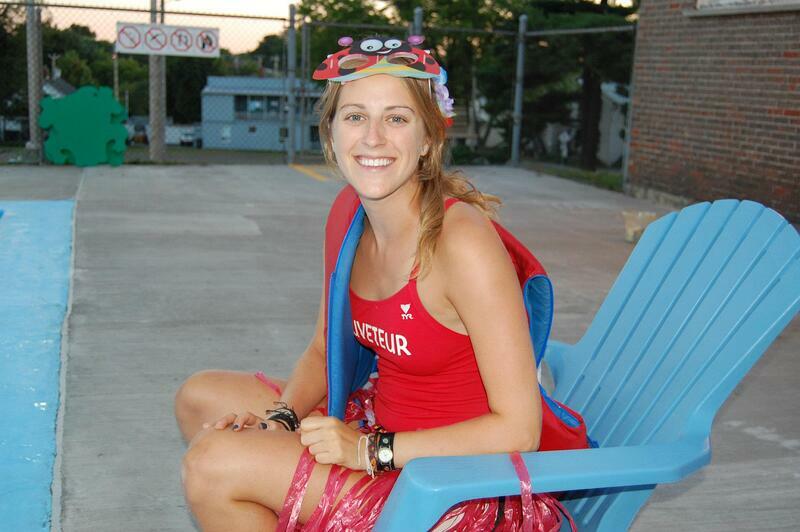 In her last two years there, she was managing five Victoriaville pools and overseeing 25 lifeguards, and she was even asked to design pool safety programs. Laurence on the lifeguard deck. During her post-secondary studies, she immersed herself in other languages, including English, German, and Spanish. She also traveled to Cuba, Peru, and Mexico, and spent a semester living with a family in Scotland. Laurence says "Learning a new language is a way for me to get to know another person from another culture – to connect with them and build real relationships." Although languages were the main focus of her university years, after graduation she began to learn more about business. 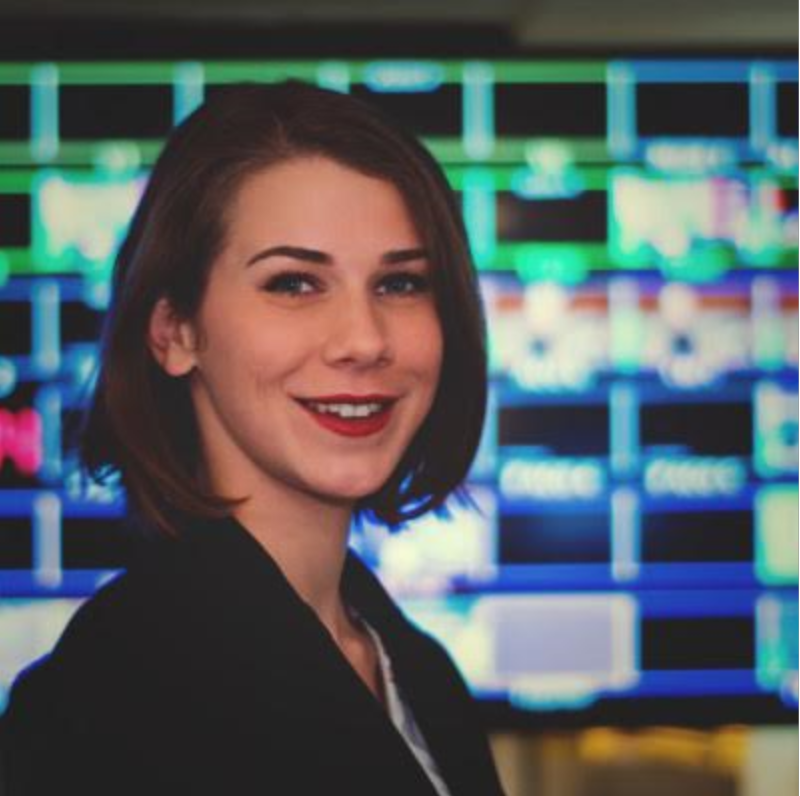 Thanks to her fluency in French, English, and Spanish, she landed an internship with a provincial ministry, where she organized trade missions for Quebec companies that wanted to explore new markets. 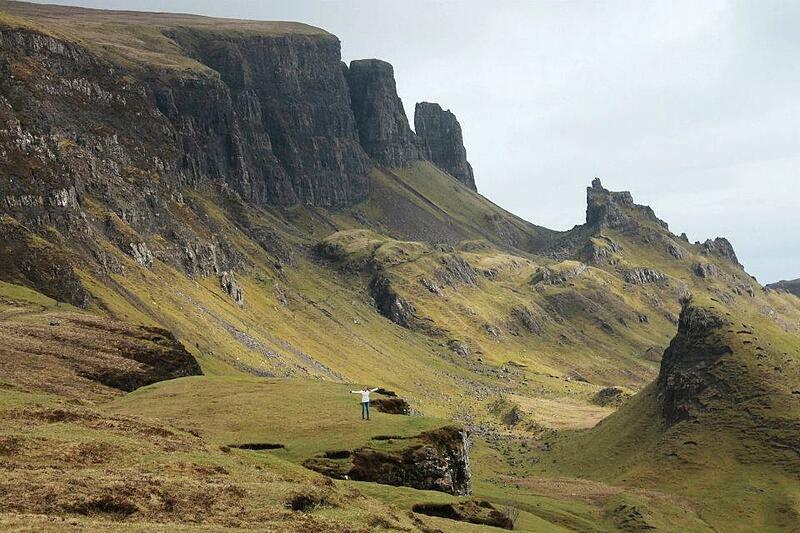 Spending a semester in Scotland doesn't seem too bad! She was becoming more and more inspired by the entrepreneurialism around her. She was closely involved with the launch of her boyfriend Mathieu’s life sciences company, Bliq Photonics, which, like Robotiq, grew out of technology from Laval University. Trade missions were also organized through a club she joined at Laval. It was there that she made contact with a Victoriaville company called MegaSecur, which was interested in the Mexican market. She would go on to be hired for a six-month contract after graduation, regularly travelling to Mexico. "We had a great relationship." She explains that her goal was to be on site, meet people, and see where would be best to sell. That would be an important six months, as she made key contacts in Mexico and tracked down leads for the company to pursue. Her international sales skills became increasingly sought-after. Following the MegaSecur contract, she was hired by another company, Creaform, which makes 3-D scanners. At the time, Robotiq CEO Samuel Bouchard was looking at growing the sales staff. Laurence’s international work fit well with plans to have clients receive more one-on-one attention. Laurence explains: "The demand was growing a lot and we wanted to have a more personalized service to offer our clients. That’s why Robotiq decided to hire inside sales specialists who would speak to those clients directly and accompany them throughout their automation projects." 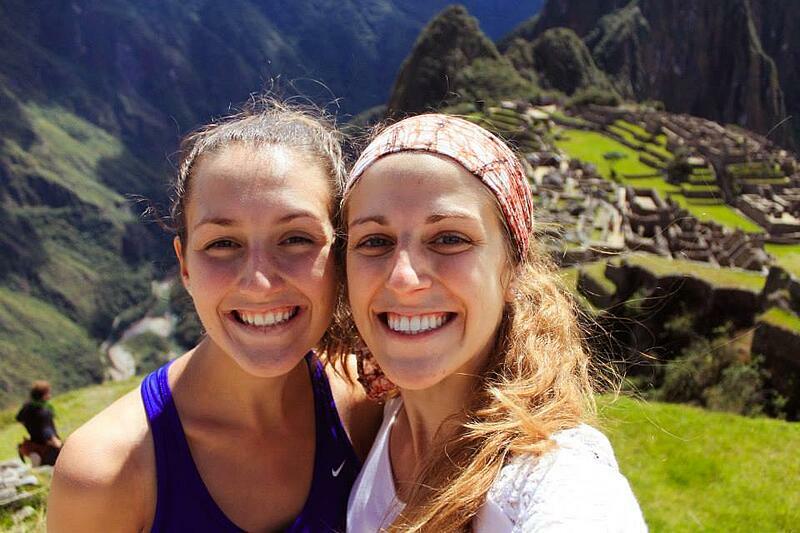 Laurence with a friend at Machu Picchu, Peru. Since being hired in Feb. 2017, Laurence has focused on helping Latin American companies in the automotive, electronics, and aerospace sectors automate their plants. She seeks to understand their needs and build bridges between the clients and their integration coaches: "There's a coach who’s available to start working on the project with the client. And I follow the conversation between coach and client. We work as a team." Mexico has been the lead player so far, but Brazil is becoming another important market. Robotiq currently has two distributors in the country – Laurence would like to see that number increase, and is tackling the challenges of Brazil's language and trade barriers head-on. From contacting trade officials to learning Portuguese, Laurence is doing what she can to develop this sizeable market. 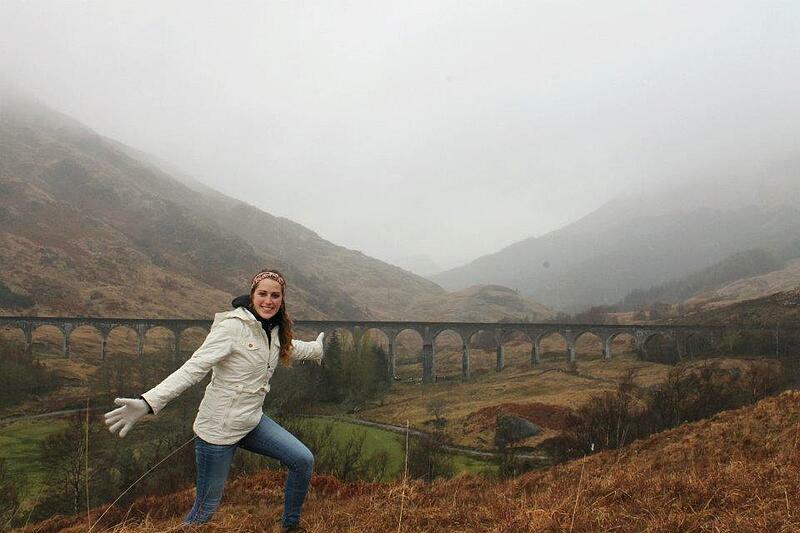 Laurence at the famous "Harry Potter" railway in Scotland. In her off-hours, she enjoys snowboarding in the winter and mountain biking in the summer. But she still has a soft spot for swimming. She finds peace underwater, where it's just her and her thoughts – whether those thoughts are in French, English, Spanish, German or Portuguese!